The New Year is officially here! Some people view the New Year as a fresh start and an opportunity to take a step in the right direction. Many of us likely committed ourselves to improving the way we live or set specific goals that we hope to attain this year. Many of the New Year’s goals and resolutions that people focus on are related to personal finance, investing, and saving. Because so many people wrap their goals around their personal finances, the New Year is a very important time for financial advisors. Financial advisors who want to have a successful 2018 year can take advantage of this time by adding clients to their portfolio. However, in order to be successful in booking prospective clients, advisors and planners must first know what it is that clients are looking for and expecting of them. To help, we’re going to go over a few things that clients really want from their financial advisors in 2018. If you are an experienced financial advisor or investor, you likely understand that every client’s situation is different. As an advisor, it is important to understand your prospects and clients. In addition, it is equally as important to relate to the struggles they are facing. Clients are looking for an advisor who is similar to them and understands the situation that they are in. Advisors can let prospective clients know that they understand their situations by focusing on a specific niche. Doing so will make it clear to prospects that you specialize in working with a certain type of person, whether your niche is occupational or company specific. A financial advisor who can solve client problems starts with an advisor who can understand their client’s situations. An advisor who understands their prospect’s situation will likely be more successful at solving their financial issues. And — let’s be clear — pitching products is not always the best solution to a prospect or client’s problem. Instead of selling a product to prospects and clients, sell them the idea of financial planning, insurance, 401(k) planning, and more! Part of an advisor’s job is to educate their clients. However, educating clients is something advisors often take too far. It is important for advisors to remember to educate their clients, but it is just as important to keep it as simple as possible. Being an expert in finances, there’s a very likely chance that you are far more educated on a particular topic than the client. Usually, the more you know about a topic, the more complex and difficult to understand your explanations will become. Knowing more about topics than your client can cause the “teaching” aspect of advising to completely go over their head. When this happens, clients may become too overwhelmed or embarrassed to ask questions, giving advisors the impression that they understood everything. To avoid over-explaining and over-educating clients, avoid using jargon and complex terms that only financial majors would understand. While an advisor who is knowledgeable may seem like it would make you seem more qualified and experienced, it may intimidate them and cause them to not want to entrust their finances. One of the biggest misconceptions about financial planning comes from the fact that people choose not to seek out the services of a financial advisor because they feel like they don’t have enough money to invest. At one point, a perception was created that you have to be a millionaire before even considering an advisor. Of course, this is false. If you are an advisor who is looking to bring in clients and grow their books, inform prospects that they don’t need $500,000 or more just to work with you. Notifying prospects of your intentions and showing that their assets are respected, no matter how large or small, will help bring them to your door. Effective client communication is one of the essential attributes an advisor should have. While keeping in touch with current clients is vital, it is also critical to keep consistent communication with prospects, too in order earn their trust. Advisors who don’t keep in touch with prospects while trying to earn their business will give them the impression that they will follow the same trend once the prospect becomes a client. Every client and prospect has different needs. For example, one client may want to meet with their advisor every quarter, while others only want to meet semi-annually. For the best client communication practice, financial planners and advisors should search for reasons to contact clients and prospects. If either just experienced a major life event, like marriage or having a baby, advisors should reach out to them and send their congratulations! If you learn someone is starting a business, shoot them an email introducing yourself and how private disability insurance may be helpful. At the very least, send out quarterly reports that summarize current events and market news to let your clients know you are still thinking about them. Now that the New Year has arrived, more people will be in search of a financial planner or advisor. 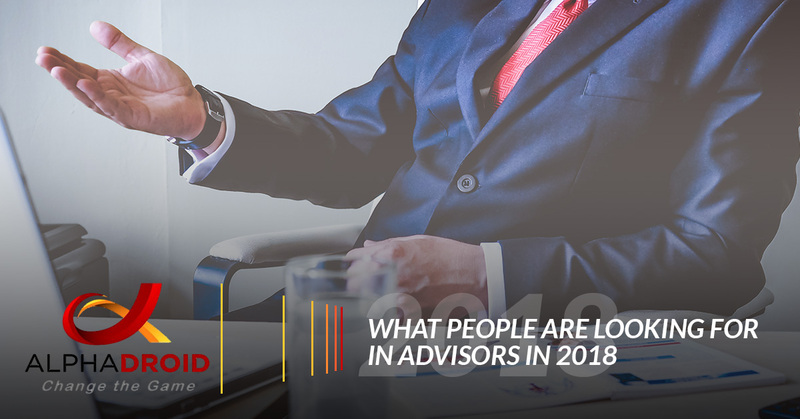 This year, clients and prospects will be searching for certain features in the advisors they choose. Financial advisors who operate their practices competently and with integrity, and who cater to the wants of prospects and clients, will be likely to grow their book of business this year. Another thing that clients and prospects expect from advisors is the protection of their investments. That’s why AlphaDroid created elite financial planning tools to help advisors with the ‘hard work’ of financial advising. Our asset allocation software provides a systematic and disciplined approach to proactively catch the best days in the market while ignoring the worst. Give your clients the professional account management they deserve by using AlphaDroid’s financial planning tools! Visit our site to learn more about the AlphaDroid technology or to start a free, 30-day trial!